Crosswords for visually impaired gamers. Blind Crossword 3D is free, accessible software that enables blind players to solve 2D and 3D crossword puzzles. It comes with dozens of 3D puzzles created by top crossword setters. It is fully voiced, and accompanies a series of charitable wall calendars produced by expert crossword setter Eric Westbrook. 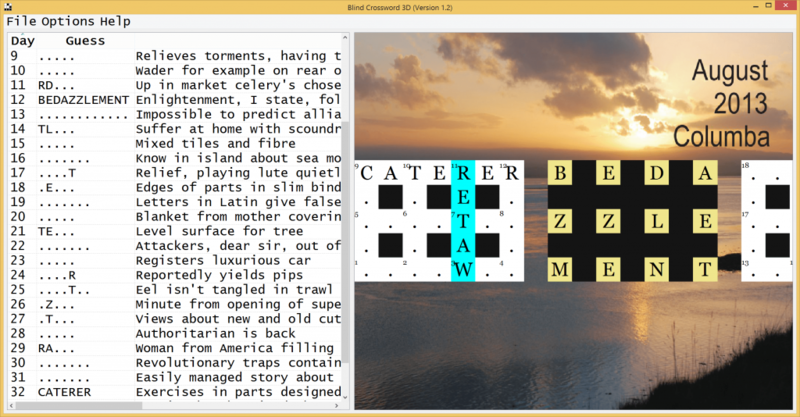 Blind Crossword 3D is available to download from Eric Westbrook’s website. Over 30 cryptic three-dimensional crossword puzzles. Sort, arrange and filter clues for easy navigation. Smoothly zoom and pan over grids with crisp text. Save and reload puzzles at any time. Print or email your solutions with a few keystrokes. The source code is available freely under the GNU General Public License. It is written in portable C++ using Qt. The text to speech voicing is implemented using SAPI on Windows and NSSpeechSynthesizer on OSX. The code repository includes all documentation necessary for building the program and creating new puzzles. You can contact me to find out more about the project. If you are interested in developing accessible games, then I can offer assistance, including advice and contacting playtesters. There are plans to create a version of the game that runs in desktop and mobile web browsers. It will be compatible with screenreaders such as JAWS, to ensure a low barrier to entry for everyone. Radio 4 – In Touch. The Guardian – Crossword Blog. The Guardian – String Time. University of York – News.